Photos by César Lucas Abreu. Visit ECF's Flickr for more photos. With its focus on “Moving Communities”, the 2017 Idea Camp follows an open call for daring ideas to build societies with greater equality, sustainability and solidarity, and a stronger sense of social justice. It is about communities on the move, communities in flux and also the power of people to “move” their communities through their progressive and creative ideas. 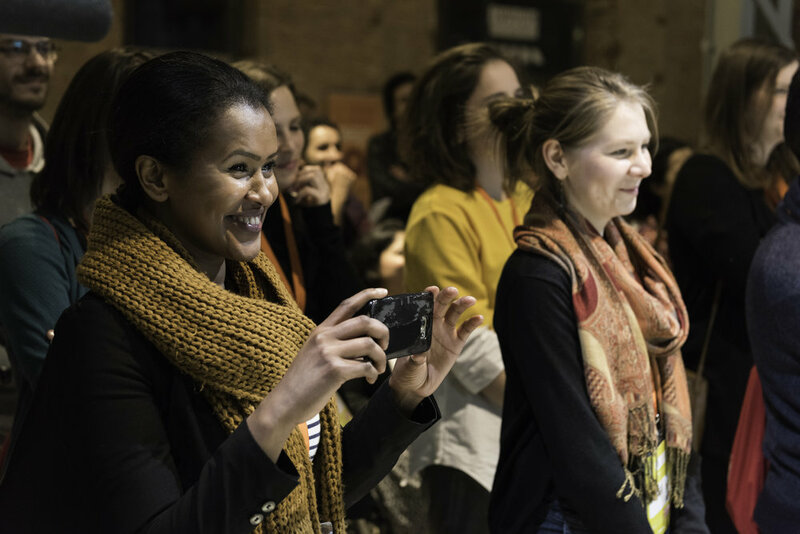 The 2017 Idea Camp brought together 50 Idea Makers from 24 countries across Europe and its neighbouring regions. During three days, participants nurtured and up-skilled the ideas that they have developed with the ambition to counteract anti-democratic practices and bring forward voices excluded from public debate and decision-making. They worked with the support of a group of guest Idea Feeders, and Facilitators- the Hubs in the Connected Action for the Commons. After the Idea Camp we invited the 50 Idea Makers to develop project proposals on their idea. ECF granted twenty-five of them with a research and development grant: Meet the 25 R&D Grantees and their ideas. The programme was articulated through a number of activities, including workshops facilitated by local collectives and the Idea Camp team, idea development sessions, walks in the neighbourhood, collective discussions, meetings with local organisations. Read our short report: Idea Camp 2017: a Common Effort in Bringing Upon a Brighter Future. In conjunction with the Idea Camp 2017, the City of Madrid, the European Cultural Foundation and the Connected Action for the Commons have organised the Innovative City Development meeting with municipal and city officials who are working in a progressive approach on cultural and urban related issues, using participatory methods. Attendees from Poland, Spain, Moldova co-exchanged about the city as commons and also meet with the Idea Makers. Check the Idea Camp 2017 photographs on Flickr. Read Idea Camp curator Lore Gablier's opening speech. Download the Moving Communities methodology, which has been designed by Platoniq, together with the Idea Camp programme team, in order to support Idea Makers transform their idea into a viable and effective project. Check the Media Coverage on Storify and in our Library. But you might start with this report. In the lab Culture and Refuge in Europe everyone can share links, pieces of writing, stories, images and thoughts – collecting, connecting and discussing inspiring cultural initiatives and voices from across Europe that explore ways of living alongside each other in these changing times. Eurozine Focal Point: Could alternative interlocal forms of mobilisation around the commons revive solidarities and keep the prospect of a common Europe alive in an age of austerity? Read more about the new focal point, created in partnership with the ECF and Eurozine. The Digital Roadbook is a a platform where all Idea Makers can register their profile and ideas. It allows all participants to identify each other and to connect before, during and after the Idea Camp. 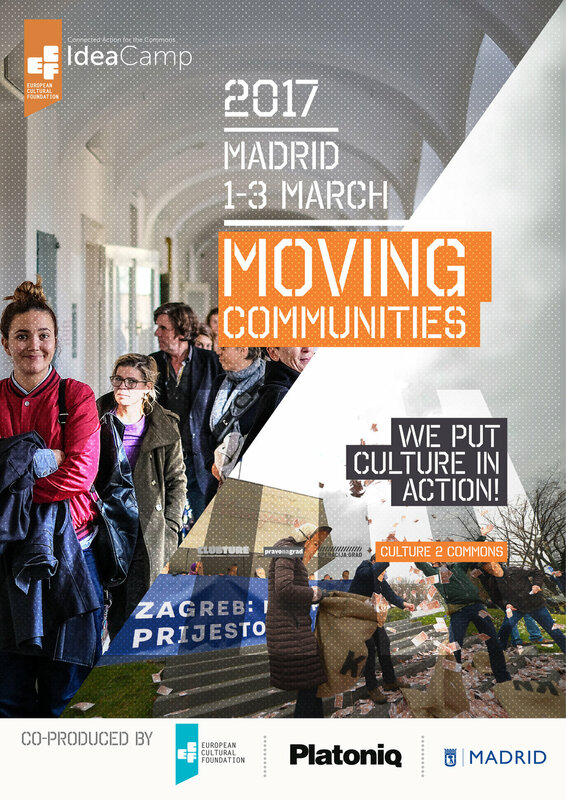 Download the Moving Communities booklet, presenting all participants to the Idea Camp 2017, including the Idea Feeders, Facilitators & Digital storytellers, and local organisations and collectives in Madrid. A report on the first of five Idea Incubator Workshops for the 2018 Research and Development grantees, which took place in Liverpool in September 2018. 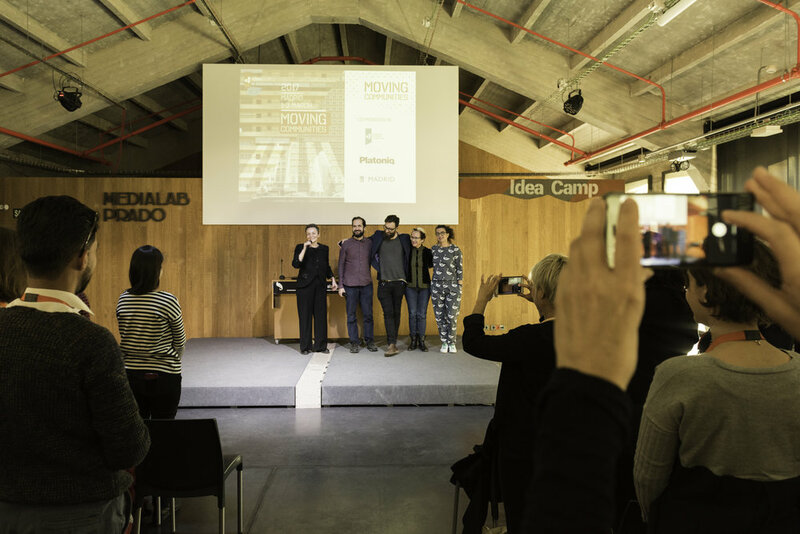 In the series of interviews with #RDgrantees, this time we feature Colectivo Warehouse - who joined the 2017 Idea Camp in Madrid. The Colectivo Warehouse organised the first Habitabis Festival. Sytze Schalk, #RDgrantee of the 2017 Idea Camp 'Moving Communities' realised a big part of his project recently: a live 'board game' in the Dutch city of Rotterdam. 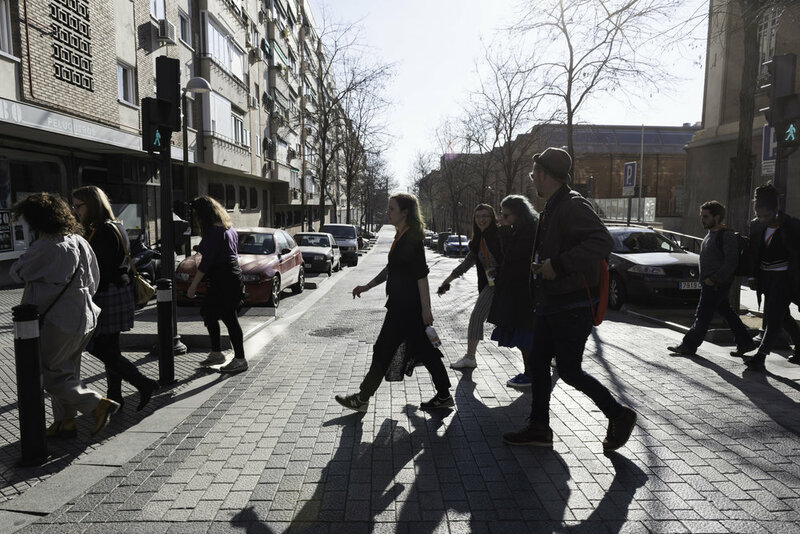 ECF’s Idea Camp is a three-day collaborative working platform organised within the framework of Connected Action for the Commons, a network and action research programme led by ECF together with six cultural organisations from across Europe. The Idea Camp 2014 took place in Marseille, France and focused on the topic "Connected Action for Public Space". The Idea Camp 2015 took place in Botkyrka, Sweden under the theme “Build the City”, applying the principles and ethics of the commons. 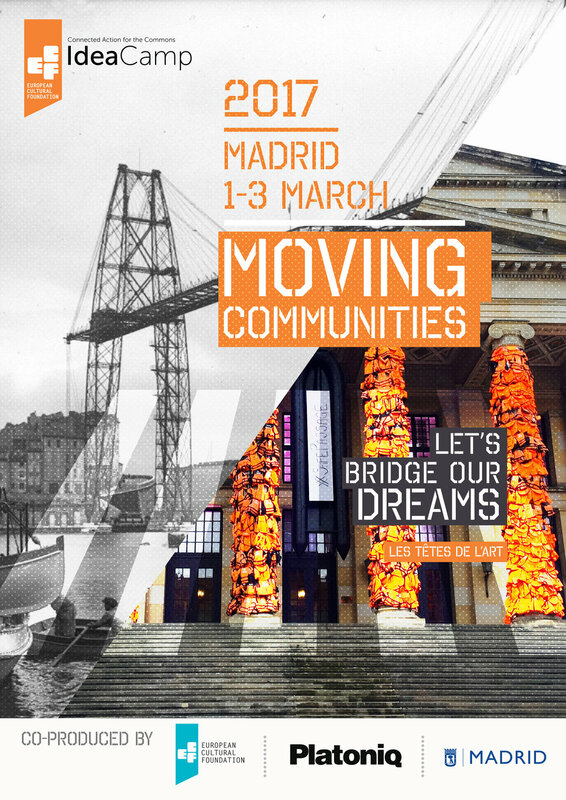 The Idea Camp 2017 takes place in Madrid on 1-3 March 2017 and focuses on the theme "Moving Communities". ECF believes in bold alternatives provided by citizens through their local cultural initiatives. At this time of transition, ECF invests in these local initiatives to help them to become enduring solutions to the challenges facing our continent. Europe as a shifting ‘home’ of changing communities – where people can live together in solidarity, accepting their differences – is an urgent priority in ECF’s focus over the coming years. We would like to thank everyone who submitted their inspirational ideas for the 2017 Idea Camp: Moving Communities. We are proud to say that we received more than 600 applications from all across Europe and neighbouring countries. contributes to discussions about genuine integration opportunities and people’s rights and accountability. fosters political imagination and promotes social justice, solidarity and equity among various social groups. Following the Call for Ideas, 50 participants were selected according to the guidelines. After the Idea Camp, participants have been invited to submit a concrete plan for further research or investigation of their ideas. A total of 25 proposals have been selected and consequently awarded an R&D Grant, up to a maximum of €10,000 each. Majdan. From an idea to European funding. #RDgrantee World Recipe Exchange: "All continents bar Antarctica!"